Tanya Ross aka TanDoll has been a professional artist for over a decade, having created her very own signature medium using an intricate method with oil pastels and colored pencils. 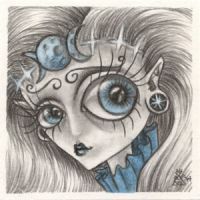 Most of her artwork is drawn in a lowbrow/kitsch big-eye style that is colorful, spunky, and at times a little silly. 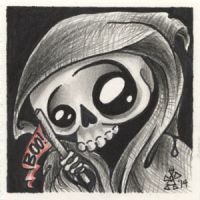 She sells her work both on her website and through online markets and auctions, and her art is licensed for items such as cross-stitch patterns and PSP tubes. A mother of two young children, Tanya enjoys drawing as often as possible but is happily distracted by her playful daughters every day. Tanya still lives in Lawton, now with her husband Nate, their two daughters, and a Chihuahua named Trogdor. You can find Prints, Originals, Hand-Embellished Prints, and other goodies on Etsy and eBay, just search "TanDoll". Fighting Crime, One Bubble at a Time!